Arrive at Vladivostok Airport, where you will be met and transferred to the centrally located four-star Hotel Hyundai. We will enjoy a welcome reception dinner at our hotel, whilst you meet your fellow travellers and anticipate the epic 15 day voyage that lies ahead. Vladivostok is a military port, located on the western shores of the Sea of Japan and is home to the Russian Navy’s Pacific Fleet. Due to its military importance, the city was closed to foreigners between 1930 and 1992. Vladivostok (literally translated as ‘Ruler of the East’) offers visitors an interesting opportunity to explore its principal military attractions including a visit to a preserved World War Two submarine. Our city tour will also take us to the iconic suspension bridge over Golden Horn Bay, one of the largest of its kind worldwide, which opened in 2012 for the APEC conference. Following a champagne reception at Vladivostok Railway Station, and with a military band playing on the platform, we will board the Golden Eagle Trans-Siberian Express. After settling into our modern, stylish cabins we enjoy dinner in the restaurant car as our rail adventure westwards begins. Located 15 miles (25 kilometres) from the border with China, Khabarovsk stretches along the banks of the Amur River. Khabarovsk was founded as a military post in 1858, but the region had been populated by several indigenous peoples of the Far East for many centuries. It is now a busy city with tree-lined streets. Located next to the station we will pass the memorial to Yerofey Pavlovich Khabarov, the Far East explorer the city is named after, and see the impressive World War Two memorial to the fallen soldiers. We will also have time at the Regional Museum where the local history has been well-preserved with a rich collection of artefacts describing the cultural and natural history of the region. 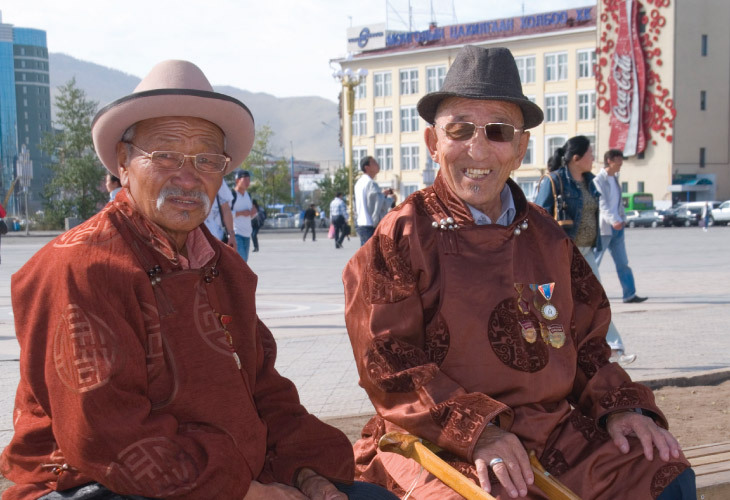 Our Trans-Siberian adventure takes us into Mongolia and a visit to its capital, Ulaan Baatar. Mongolia, once the very centre of an enormous empire led by Genghis Khan, is a country of beautiful landscapes, nomadic people and rich in culture and history. Mongolia is famous for its endless green Steppes, grazing livestock and white, nomadic Gers (Yurts) dotted all across the countryside. We start the tour at Gandan Monastery, one of Mongolia’s most important Buddhist Monasteries housing a community of over 500 monks. The full name, Gandantegchinlen, translates as ‘the great place of complete joy’. At Chinggis Square (formerly Sukhbaatar Square) we can see the central monument to Genghis Khan, undoubtedly the most feared and revered Mongol. We then drive out of the city to Gorkhi-Terelj National Park for a unique opportunity to experience a taste of the traditional Naadam Festival, with a spectacular display of horse-riding, wrestling and archery, the three games of the festival, performed by members of the local community. We will meet a nomadic family in a traditional Ger and learn more about their historic culture and customs. Alternatively, there is an option to stay in the city as part of our Freedom of Choice touring. After Gandan Monastery and Chinggis Square we visit the National Museum where we learn about the country’s intriguing history. We will also see Bogd Khan Winter Palace Museum, the winter residences of Bogd Khan, the last Mongolian emperor, built between 1893 and 1903. We can also explore the city and have some free time for shopping for Mongolian souvenirs, and their speciality cashmere. We will also enjoy a performance of traditional Mongolian throat singing and contortionists. Few natural sights can surpass the beauty and grandeur of Lake Baikal and is a major highlight on our Trans-Siberian journey. Lake Baikal is the deepest lake in the world and holds 20 per cent of the world’s freshwater. 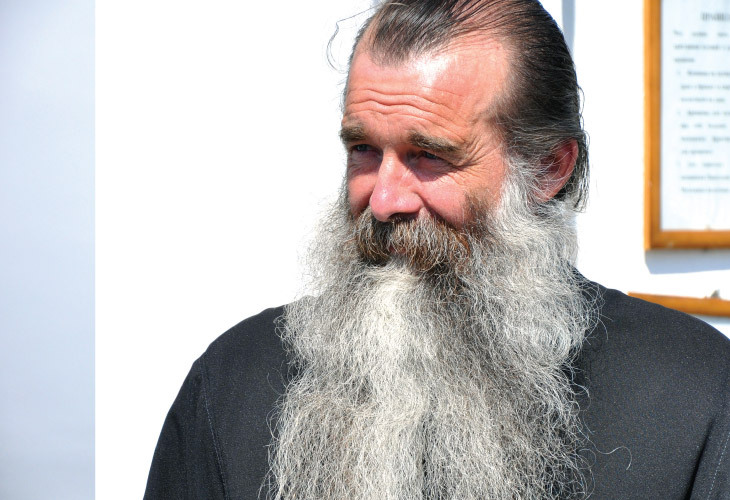 Also known as the ‘Pearl of Siberia’ it is home to a unique breed of freshwater seal and over 50 species of fish including omul. For five hours we wind our way through tunnels along cliff hugging tracks above the lake with a vista of snow capped peaks along the far shore forming a picture-perfect backdrop. To add to the grandeur of the day our Golden Eagle train will be hauled by a Soviet era steam locomotive on this beautiful section of the line. There will be plenty of opportunities for photographs as the train winds its way along the lake. This will be an unforgettable part of our journey. Weather permitting, we stop in an extremely picturesque location by the lake for photographic opportunities and for the brave hearted there is time for a refreshing swim in the crystal clear and ice-cold waters of Baikal. Travelling onwards to the end of the Baikal branch line, we leave the train and travel by boat on the lake to Listvyanka, a small Baikal settlement nestling at the base of the surrounding hills and visit the Lake Baikal Museum and Aquarium where you can learn about the flora and fauna of the lake. We will enjoy a delicious barbecue, including freshly smoked omul fish, prepared by our own chefs on the shore of Lake Baikal to complete a memorable day. As part of our Freedom of Choice excursion programme you can choose a hiking opportunity that offers some spectacular and panoramic hillside views of the lake below. Our visit to Irkutsk, the ‘Paris of Siberia’, takes in the most significant sites and museums in this fascinating city, including an exploration of the classic wooden architecture with its intricately carved lace- like decorations that has given many of this region’s buildings such a distinctive and unique appearance. We also visit the Volkonsky House Museum, which is dedicated to the memory of the aristocrats who were exiled to this remote outpost after the failed Decembrists uprising of 1825, and we recreate the atmosphere of that time with a champagne reception and private concert. You could learn to cook some traditional Russian dishes with a local chef and prepare your own lunch with our Freedom of Choice option. Or you might also wish to visit a traditional Russian Dacha (summer house) or an urban apartment to get an insight into the everyday life of an average Russian family. Founded in 1723 by Peter the Great, Yekaterinburg, is the capital of the Urals. Known as the Great Divide, the Ural Mountains create the natural border between Europe and Asia so that the cultural and architectural influences of European and Asian civilisations come together in this fascinating and cosmopolitan landscape. Our city tour takes us to the poignant site where the Romanov, Tsar Nicholas II of Russia, was executed with his family by the Bolsheviks in 1918 following 78 days of imprisonment. 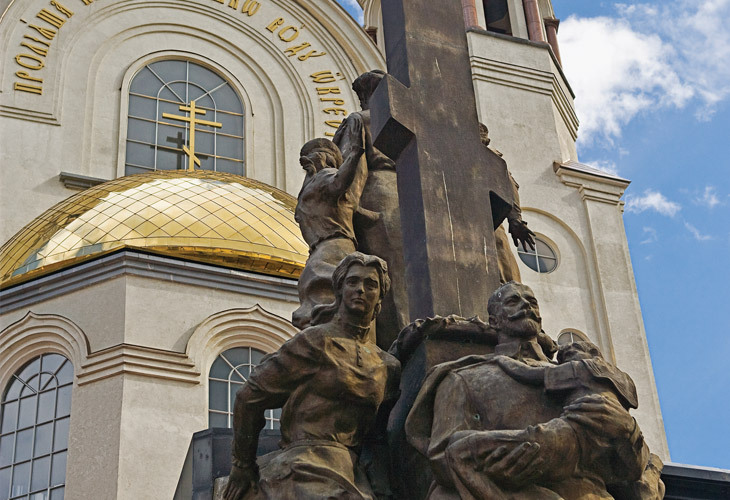 Now a church dedicated to their memory, this site provides us with a powerful insight into the turmoil of the Russian Revolution. Our Freedom of Choice programme features a visit to the recently opened Museum of Military Machinery. The museum houses an amazing collection of different types of military hardware including tanks, aircraft, boats and even armoured trains. You will also see a wide range of civilian vehicles (particularly Russian models). The museum is a real treat for anyone with an interest in the Soviet past, unparalleled by anything else along the route. 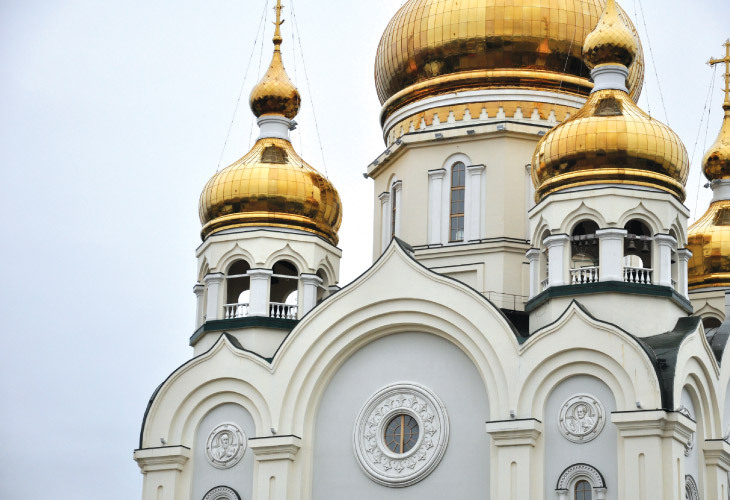 Our touring programme of Moscow principally takes us to the grandeur of the Kremlin – the spiritual, historical and political heart of Moscow – and to see the treasures of the Tsars in the Armoury Chamber. We also visit Red Square, an iconic symbol of Russia’s former military and political might with its eclectic mix of fascinating architecture, such as the ornate St Basil’s Cathedral’s magnificent onion-domed spires, the beautiful fac?ade of the world famous GUM department store, constructed in Tsarist times, and the sombre and evocative site of Lenin’s tomb. If you have been to Moscow before we offer included Freedom of Choice touring where we show you other sights of Moscow such as the famous State Tretyakov Gallery (National Museum of Fine Art) or the Space Museum (subject to train schedule). Included in our time spent in Moscow is one night at the luxury five-star Ritz-Carlton. Superbly located in Moscow city centre, and within easy walking distance of Red Square, the Kremlin and the Bolshoi Theatre, this historic hotel offers spacious and luxurious accommodation. The O2 Lounge, a stylish rooftop terrace, features panoramic views over the Red Square and the Kremlin. The spacious ESPA spa centre includes a hot tub, indoor pool, and 14 treatment rooms. Crystal lighting, candles and beautiful facilities create the perfect atmosphere, and a wide variety of spa treatments, as well as the sauna, are available. There is also a fitness centre, and a beauty salon. Our final evening is spent saying our goodbyes to our fellow travelling companions and friends at the Farewell Dinner. Following breakfast, any free time can be spent exploring this rapidly evolving city. It is possible that we will visit The Kremlin this morning. At the conclusion of your time here, you will be transferred to Moscow Airport to begin your journey home. Why not extend your stay in Moscow with additional nights to explore more of the city at your leisure or have time to take in a performance at the world-renowned Bolshoi Theatre? Tickets need to be pre-booked and are subject to schedule and availability. This entry was posted in Documentation and tagged Moscow, Russia, Trans Siberia Express. Bookmark the permalink.